The Santa Catarina mainland close to Florianopolis is just as varied and attractive as the island (also called Santa Catarina!) itself. The coastal strip has the same beautiful beaches, strong surf and bracing breezes that attract sun-seekers, surfers and kite-surfers to the region from all over Brazil and the world. The waters attract far more than just people on boards though, with Southern Right Whales visiting the sheltered bays along the coast every year in pleasingly increasing numbers. 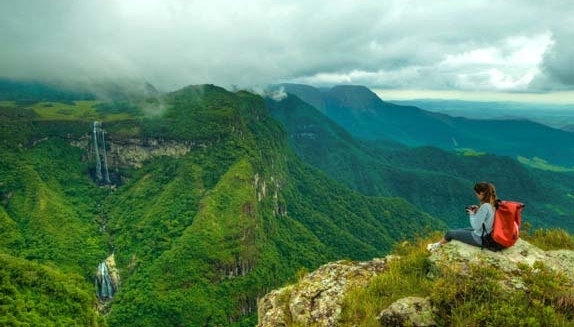 The mountains leading up to the inland plateau provide waterfalls and rapids, thermal springs and cooler mountain air, flight ramps and treks and climbs including the largest canyon system in Brazil. Leaving Florianopolis for some days on the continent (back in Brazil!) close by leaves you with fantastic options day and night. Similar to the island, Santa Catarina also boasts some of the very best clubs in Brazil close to Balneario Camboriu. Hiring a car from Florianopolis and braving the BR101 Highway, you can travel north or south to find beaches as good as any in Brazil, and with their own unique charm. You can take it as read that all the beaches mentioned are beautiful, and also that they have excellent surf, with Imbituba hosting the ASP World Surf Tour Brazil Events. A tour of the southern beaches is highly recommended. Guarda do Embau is perhaps the best of them all, with its unique strip of sand guarded by two rivers that curve behind the sand and meet in the mangrove forest before arriving together at the sea in the shelter of the headland at the northern end. The sandbank in the middle of the shallow river can be crossed on foot, but the main part of the river is deeper and can be paddled on a board or punted on a boat if you don’t fancy the swim. The river has protected the beach from any development and the sand and dunes stretch into the distance. The village itself has enough life in the high season to keep it interesting, and can be very peaceful at other times. Garopaba styles itself as the Surf Capital of Brazil, a small town with great beaches close by and plenty of surf shops. The best beaches such as Praia Silveira are often hidden in the headlands. The dunes of Siriu are extensive, beautiful and great fun, with sand-boards and toboggans available for hire at the bottom of the slopes. There is much laughter to be heard ringing around the dunes as people try sand-boarding for the very first time. It can be a long walk back up, especially if your board has descended most of the way down without you! 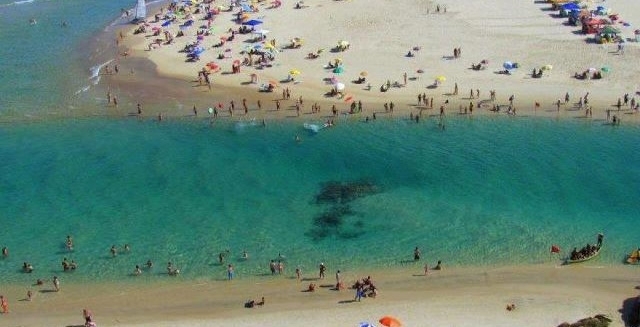 Praias Ferrugem and Barra are quiet out-of-season beaches that only fill up at holiday times. Ouvidor and Vermelha are often almost empty beaches, although they take a rough road or a walking trail to arrive there. Both are sheltered by tall pines and beautiful places to spend an afternoon. Praia do Rosa is perhaps the most famous of them all and also maybe the best option for a place to stay on the Santa Catarina mainland. The town still has its dirt and sand roads, plus many beautiful pousadas on the hillsides overlooking the beach. A lagoon or two nestle in between the hills and the beach, and from some pousadas, the only way to get to the beach is by boat. Rosa is possibly the most popular town for surfers to stay, and the lagoons and waves around Ibiraquera make it one of the best kite-surfing spots in the whole of Brazil. Roads lead around to most of the beaches from Rosa, while trails take you through the Atlantic Rainforest and vegetation of the headlands to the neighbouring beaches such as Silva. Imbituba has the port, which is growing all the time. The town itself is not so interesting and not worth stay, better to drive down from Rosa. What it does have those is Luiz, who work for the IBAMA environmental organisation. They run the whale-watching boats which depart every day when the Southern Right Whales are frolicking in the bays of Ribanceira and Rosa, usually between June and November. These 16m monsters were hunted all along the coast by the first Azorean settlers, and declined drastically in numbers. With the protection of IBAMA, they have returned in increasing numbers over the last 20 years, and the boat trips allow you a close up look at them, and sometimes for these curious creatures to have a close up look at you. The boats must stop at a safe distance from the whales, with engines off, leaving it up to the whales to decide whether they want to approach. They often come right alongside and surface to see who is inside watching them. The whales are not the only large marine life found in the waters off Santa Catarina. The first stop heading north from Florianopolis is the Governador Celso Ramos peninsula. The prosaic name belies the beauty of the mountainous area, with its simple fishing villages and turquoise waters, although the Ponto dos Ganchos Resort does provide a touch of hidden luxury. Dolphins congregate in large numbers in the bay (‘Baia dos Golfinhos’) off the surprisingly remote and tranquil Armaçao de Piedade village. Another hilly green peninsula carved with beautiful beaches is a little more developed and lively at holiday times. Porto Belo and Bombinhas are the main beaches, with Mariscal and Zimbros being a little quieter. The headland above Canto Grande shelters the remote Tainha Beach. The journey over the top to it is worthwhile for absolutely stunning views up and down the Santa Catarina coastline and over to Florianopolis. Balneario Camboriu is known as Riozinho (Mini Rio), with its long beach, wonderfully tacky statue of Christ (Cristo Luz) and high rise buildings. Unfortunately, unlike Rio, these buildings block out the afternoon sun. The crazy planning doesn’t deter visitors though, and the high season crowds still flock to that beach and also to those around the headland such as Laranjeiras, Estaleiro and Taquaras. You may have to leave a little something behind if you visit Praia do Pinho though – it is one of Brazil’s few nudist beaches. If that isn’t a reason for you to visit Balneario Camboriu, then the clubs in the area may well be. Green Valley and Warung Beach Club attract some of the best known House Music names in the world such as Erick Morillo, Paul van Dyk and Groove Armada. They attract the Beautiful People, and when we are talking about South Brazil, this is often very beautiful indeed. Away from the coastal strip, the roads wind up through the mountains to the plateau some 1,000m above. The rivers running down the valleys around Sao Pedro de Alcantara and Santa Amaro do Imperatriz have rapids for white-water rafting, and some of the best flying winds in the whole of Brazil. 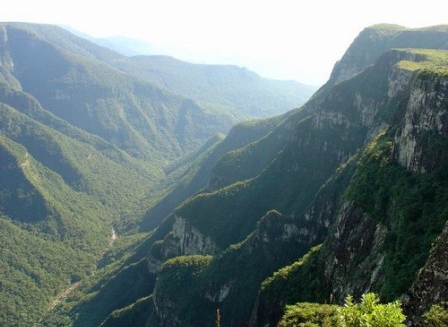 The spectacular road up the Serra do Rio do Rastro makes it onto many postcards, and leads up to Bom Jardim da Serra and Sao Joaquim and Urubici. 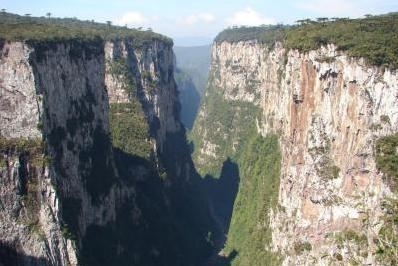 This plateau has many waterfalls, caves and spectacular views down to the sea below. 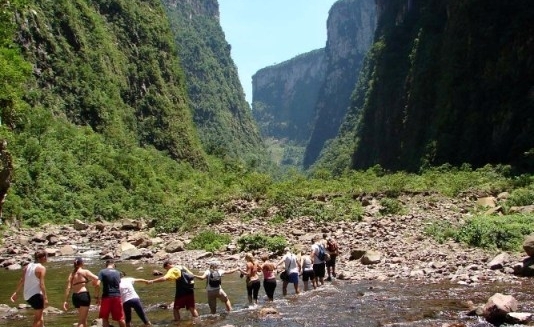 It also has a spectacular descent through the largest canyons in Brazil at Itaimbezinho, with trekking, climbing and horse and mountain biking opportunities there and all along the Serra Geral. The mainland of Santa Catarina is just as diverse, just as adventurous and just as beautiful, and just as lively as Florianopolis. Only much bigger. Suitable Destination For: Those who enjoy a beach crawl, with as much action in the waves, dunes and lagoons as in the nightlife. Best Time to Visit: Santa Catarina has summer and winter seasons, although the difference can be difficult to notice on sunny days. The high season of January and February can be busy on the beaches and the roads. Essential Sights & Activities: Beaches Galore; Surf; Guarda do Embau; Praia do Rosa; Brazil’s Best Clubs; Itaimbezinho; Southern Right Whales.